Dr. Hegeman did his undergraduate training at University of Kansas, and went on to complete medical school at University of Kansas School of Medicine, where he received the Delp Award for Compassion in Medicine. He completed his Internal Medicine residency at Medical College of Wisconsin in Milwaukee, where he was appointed Chief Resident. 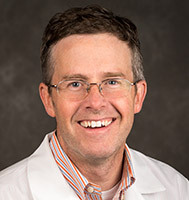 He completed a Medical Oncology Fellowship in the summer of 2005 at the University of Wisconsin Carbone Cancer Center Medicine and is board certified in Medical Oncology. He sees a range of hematology and oncology patients and is a member of the UW Health Breast Center.